The prospect pool in Tampa Bay is slowly growing to the delight of Lightning general manager Steve Yzerman and director of amateur scouting Al Murray. That's particularly encouraging when you consider the organization will be holding auditions for two wings and a third-line center during training camp. "In the last two drafts and with some free-agent signings, we filled a lot holes that were in the organization," Murray told NHL.com. "There were some holes in goal and on defense and also down the middle and we've added some wingers as well. I think with the combination of free agent signings from college and junior, and our last two drafts, we've balanced things out pretty good and our top end is pretty respectable." 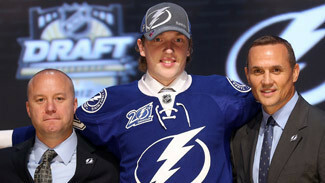 Yzerman filled his short-term needs in goal, and also took care of a few long-term requirements with the drafting of a few high-end defensemen in the 2012 Draft. His first three picks, in fact, were two defenders and a goaltender. "Our focus on this draft was to address some of the needs for our team and trying to get some goaltending and defensemen," Yzerman said. "We weren't going to take D just to take D, but we liked certain guys who were big and who had good skating ability." 1. Andrey Vasilevskiy, G: He burst onto the scene at the 2010 Under-18 World Championship when he led Russia to a fourth-place finish as a 15-year-old. He then led his country to a bronze medal at the 2011 U-18 World Championship, finishing 4-2 with a 2.62 goals-against average and .936 save percentage. Most recently, the 19th-overall selection last June earned a silver medal at the 2012 World Junior Championship, finishing with four wins, two shutouts, a 2.01 GAA and .953 save percentage. Murray said it's still uncertain whether or not Vasilevskiy will play in North America or in Russia for 2012-13, but that, "it's being explored." "Andrey has the size (6-foot-3, 210 pounds) and technical ability you're always looking for in a goalkeeper these days," Murray said. "He has a mental toughness that he's shown by playing in a number of international events as Russia's top goalie in three of the last U18 tournaments and World Juniors as a 17-year-old. He's a competitive young guy." 2. Slater Koekkoek, D: The 6-foot-2, 183-pound Koekkoek played 26 games with the Ontario Hockey League's Peterborough Petes last season and produced five goals and 18 points, which ranked third on the team among defensemen. Tampa Bay's first choice (No. 10) in the 2012 Draft missed the final 42 games because of an injury suffered during the regular season. "He's got tremendous skating to go with real good size and a terrific competitive streak," Murray told NHL.com. "He's more skilled than people give him credit for. He hasn't really had the opportunity to show his offense with Peterborough, but he did at the Under-18 tournament two springs ago in Germany. There's no question we think he would have been a much higher rated player [if not injured] than most publications had him prior to the draft." Koekkoek is a product of the prestigious Notre Dame Academy in Wilcox, Sask., the same school that produced Lightning captain Vincent Lecavalier. 3. J.T. Brown, F: The 21-year-old versatile forward and son of former NFL running back Ted Brown of the Minnesota Vikings was a sought-after collegiate hockey free agent who gave up his final two years of NCAA eligibility when he signed with the Lightning in March. The 5-foot-10, 170-pound forward played in 39 games with the University of Minnesota-Duluth as a sophomore this past season, producing 24 goals and 47 points. Brown, who has an outside chance of earning a roster spot out of training camp, was a member of the team that captured the 2011 national championship and was named the tournament's Most Outstanding Player. "A number of teams were in the bidding for J.T. 's services and we're happy he chose Tampa Bay," Murray said. "He finished the end of the season five games at the end of the year and showed himself very well on one of our top two lines. J.T. will be right in the thick of competing for a regular position with Tampa Bay this year." 4. Cory Conacher, LW: Was named the winner of the Les Cunningham Award as the American Hockey League's most valuable player for 2011-12 after notching 35 goals and 75 points for the Calder Trophy-winning Norfolk Admirals. He tied for second in the league with 14 power-play goals, represented the club at the 2012 AHL All-Star Classic and was named to the AHL All-Rookie Team. Conacher became the fourth rookie to win the award since it was first presented in 1947-48, joining Bill Hicke (1958-59), Pelle Lindbergh (1980-81) and Stephan Lebeau (1988-89). The undrafted 5-8, 180-pound Conacher spent four seasons at Canisius College before inking an AHL contract with Norfolk. He signed a two-year NHL deal with the Lightning in March. "He's another player similar to a Marty St.-Louis in size … I don't want to compare them as players, but in size," Murray said. "He's got a competitive streak. Like J.T. Brown, he'll come in and have a chance to compete for a spot on our team. He really proved himself as a first-year pro last year as the dominant offensive player in the AHL." 5. Vladislav Namestnikov, C: He'll turn pro this season and likely begin the year with the team's AHL affiliate in Syracuse, although there's an outside chance of him making the big club out of training camp. Namestnikov has done all there is to do in two seasons with the OHL's London Knights -- producing 52 goals, 140 points and a plus-27 rating in 131 career games. While a groin injury slowed him this season, he still struck for 22 goals and 71 points. "We see Vlady as incredibly dedicated and confident with and without the puck," Murray said. "He's used by his coaches in every situation. On the power play, he's either on the half-wall or running it from the point; on the PK he's out there blocking shots and using his speed. "He has a change of pace that surprises players when he comes down on them offensively, and he's got a grit that surprises players when they come after him because he's not the strongest guy yet. The biggest thing with Vlady is how soon he can continue to gain strength and take it to another level, but we think he's very close to an NHL-caliber player right now." 6. Alex Killorn, C: Since the day he was drafted in the third round (No. 77) in 2007, Killorn has grown both on and off the ice. He was 5-foot-8 and 170 pounds on draft day and when he made his professional debut with the Admirals last April, was already 6-foot-1 and 197 pounds. "He's a player we talked about turning pro after his junior year, but he wanted to finish off things in Harvard and we had no problem with that," Murray said. Killorn spent the last four years with the Harvard Crimson of the ECAC and was a Hobey Baker nominee in 2011-12 after posting 23 goals and 46 points in 34 games. In 17 playoff games for the Calder Cup-winning Admirals, he had three goals and 12 points with a plus-five rating. He's primed for a breakout season with the team's AHL affiliate in Syracuse this fall. "He progressed every year as a player both offensively and defensively," Murray said. "He's got a quick release and a nose for the net offensively, and is a real big body and hard player to play against without the puck. Alex is a player we've been waiting for and are excited about." 7. Mark Barberio, D: The 2008 sixth-round pick was named a First Team All-Star and was the recipient of the Eddie Shore Trophy as the most outstanding defenseman last season in Norfolk. In his second AHL season, Barberio, who offers great offensive instincts, had 13 goals, 61 points and a plus-28 rating in 74 games. He also struck for seven power-play goals. 8. Richard Panik, RW: The big Slovak completed his first full pro season in Norfolk in 2011-12, notching 19 goals and 41 points in 64 games. His greatest asset is his powerful shot, but just needs to show a bit more consistency. The 2009 second-round pick (No. 52) had five goals and six points in 18 playoff games for the Admirals. His most memorable goal came May 11 in overtime against the Connecticut Whale in the AHL's second round of the playoffs. Forced to leave the game with two chipped teeth in the third period after taking a slap shot to the face, Panik would ultimately return and connect for the clincher 13:01 into OT to help send Norfolk to the Eastern Conference final. 9. Nikita Kucherov, RW: Kucherov connected for two goals and seven points in seven games for silver medal-winning Team Russia at the 2012 WJC. He might close out his junior hockey career with the Quebec Remparts of the Quebec Major Junior Hockey League, if he doesn't make the jump to the pro level this season. The 6-foot, 165-pound Russian spent most of 2011-12 with the CSKA Krasnaja Armija Moskva in the MHL, notching 24 goals and 43 points. 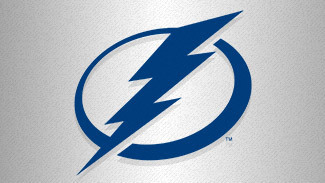 Scouts have said that Kucherov, a 2011 second-round pick (No. 58) by the Lightning, is regarded as a game-breaker and natural goal-scorer. 10. Tyler Johnson, C: The 5-9, 174-pound undrafted free-agent signee was labeled the best offensive prospect following a breakout season with the Admirals in 2011-12, connecting for 31 goals and 68 points in 75 games. He also chipped in with six goals and 14 points in 14 postseason games. Prior to turning pro, Johnson showed improvement each season with the Western Hockey League's Spokane Chiefs, producing 35 points as a rookie in 2007-08 before notching 61, 71 and 115 points, respectively, the following three seasons. His 53 goals as an alternate captain in 2010-11 led the WHL.